Sedentary definition for infants (less than 1 year or pre-walking): Any waking behaviour characterized by low energy expenditure while restrained (e.g., stroller/pram, high chair, car seat/capsule), or when sedate (e.g. reclining/sitting in a chair with little movement but not restrained). Time spent in the prone position (“tummy time”) is not considered a sedentary exposure. Sedentary definition for Toddlers and preschoolers (age 1-4): any waking behaviour characterized by an energy expenditure ≤ 1.5 metabolic equivalents (METs), while in a sitting, reclining or lying posture. 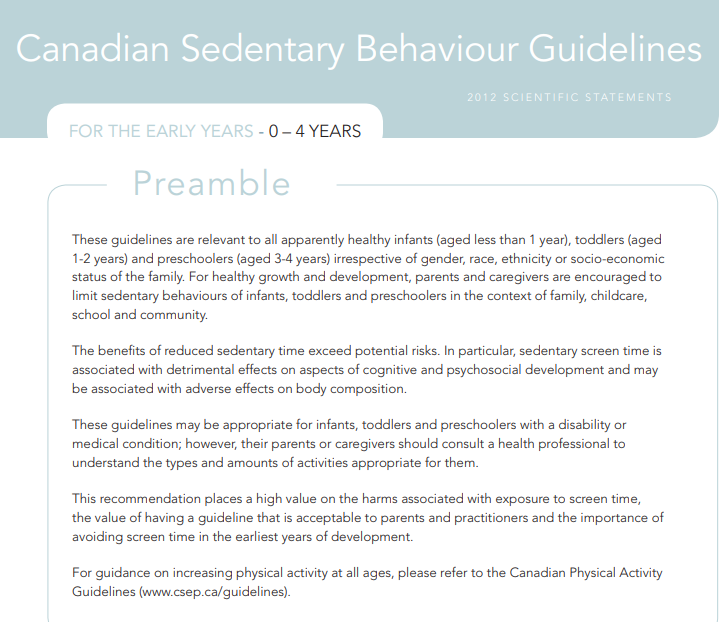 In 2012, the Canadian Society for Exercise Physiology (CSEP) published Sedentary Behaviour Guidelines for children 0 to 4 years of age.